Caddie/Coach for the Challenged Golfer with special needs. Frank Selva: 203-397-9806 -- Frank’s roots into the golf world began as a caddie and later CaddieMaster for over 13 years of service. 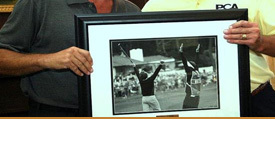 Frank has been the Head Golf Professional at Race Brook Country Club since 1976. Frank has received numerous awards for teaching and community accomplishments during his career. Most recently Frank received the Junior Golf Leader award by the PGA of America for his tremendous contributions to junior golf. The awards also include Golf Professional of The Year, Horton Smith Award, Junior Golf Leader, and Bill Strausburgh Award (twice). In 2004 Frank received the Knight of Honor Award from Notre Dame High School. Frank is very active with Special Olympics, junior golf, inner-city golf, and working with the physically handicapped in the state. In 2003, Frank represented the U.S. at the Special Olympic World Games in Dublin Ireland, as the technical delegate and advisor. These are just a few of Frank’s cherished accomplishments. YA GOT TA SEE THIS Great heart and golf story here: The next Tiger Woods?? Please join us at the 12 noon press conference and photo opportunity also..